I love nail art, and being very creative I always make my nails a statement. I wanted something classy yet edgy and came up with this design. It's so easy and so simple. I used Andrea Fulterton Sparkle & Stripe nail varnish in India. I'm a huge fan of Andrea Fulerton. Always bang on trend at affordable prices. This one was £4.99 from Superdrug. An absolute steal as it has an amazing thin applicator and an end where you can add sparkles to any mani. I also used Rio Nail Art Pen in black which you can get in a set, or singly for £5.95 from Rio Nails. First step is as simple as the rest. With the India colour I used the small brush applicator to go from one corner to the opposite corner over clear painted nails. Then filled in the top half with the same colour. 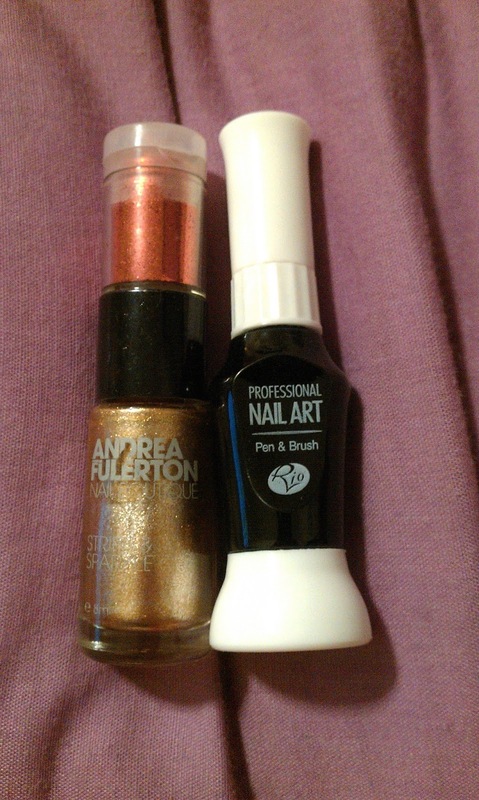 Then using the Rio Nail Art Pen I followed the gold line to make a defined difference between the bare nail and gold. So there we have it. A simple, classy yet edgy look for the posh bird and the punk, and everyone in between. Wow, your nails look so amazing! =D I LOVE the gold against the black! =D I'm your newest follower via google (204) and twitter (as sensiblestylist)! I'd really love it if you could check out my blog and follow back? so cute! I love pretty fun ways to do my nails. I actually posted a how to at home manicure today on my blog. how funny. I love this and you have done it to perfection! That gold is so pigmented! The gold color looks gorgeous on you. Wow, this looks great, Hannah! Such a unique design- well done!